SeaWorld Parks & Entertainment operates a chain of adventure parks across the country including Busch Gardens, Adventure Island, Discovery Cove, and the three SeaWorld parks in Orlando, San Antonio, & San Diego. SeaWorld is the world’s most popular marine-life park. Seaworld Orlando was the home to the first killer whale born and raised in captivity. In addition to killer whales, other sea mammals at the parks include beluga whales, bottlenose dolphins, sea lions, otters, walruses, penguins, and an array of other marine life. Sea World also features a variety of thrill rides plus Shark Encounter, where guests actually travel inside an acrylic tunnel which passes through the shark tanks. “To instill in students and guests of all ages an appreciation for science and a respect for all living creatures and habitats. SeaWorld offers a variety of Marine Animal Internships at its various locations around the country. 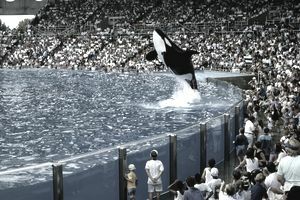 To begin the process of applying for a Seaworld internships, please visit their website. Veterinary externships are also available.